Salted caramel just may be my favorite thing in the world. Whether it’s in the form of caramel sauce, chewy caramels, or the sweet and salty crunch of caramel corn…I love it all! When trying to decide what to make for our PTA’s Pumpkin Tour a couple of weeks ago, I noticed that I didn’t have any cupcakes devoted to that sweet & salty combination that I love so dearly. That was a situation that needed to be remedied immediately! So, I did what I always do with experimental cupcakery – used my favorite vanilla cake recipe, and then proceeded to add a bunch of homemade salted caramel sauce to it. Same deal with the buttercream frosting. 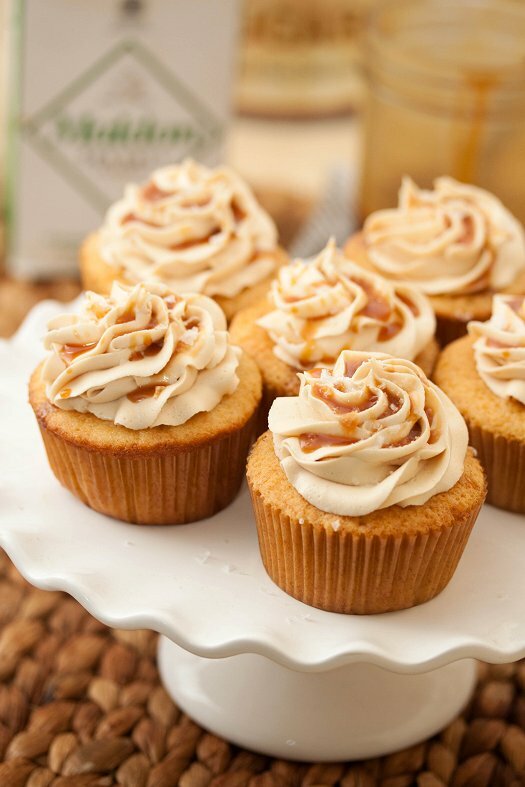 An additional drizzling of sauce and a sprinkle of top-notch sea salt…and you have yourself a damn fine cupcake! While I love fleur-de-sel, I used Maldon sea salt here, which is actually a British hand-harvested sea salt. The crystals are giant square shaped flaky pyramids, but still as light as a feather. They really show themselves off nicely, and don’t just melt into the frosting as some finer salts would. I ordered mine online a year or so ago, but I’m pleased to report that my local gourmet food shop now carries it for a really reasonable price – so if you’re local, Poseidon’s Pantry here on Chincoteague has you covered. What you end up with is a deliciously tender and moist cake bursting with the roasty sweet notes of caramel. And the pinch of sea salt on top just adds the perfect salty bite and slight crunch. They went in a flash at the bake sale, and I know it’s definitely one I’ll be making again and again. It’s also great in cake form as well! I hope you get a chance to make and enjoy it soon. Have a great weekend, everyone! Combine the buttermilk and vanilla extract in a liquid measuring cup. With the mixer on low speed, add the dry ingredients alternately with the wet ingredients, beginning and ending with the dry ingredients and mixing just until incorporated. Scrape down the sides of the bowl, add in the caramel sauce, and mix for 15 seconds longer. For the frosting, in the bowl of an electric mixer fitted with a paddle attachment cream the butter over medium speed for 1 minute. Reduce speed to low, and carefully add in the confectioners sugar and the pinch of salt. Add the vanilla extract, as well as the caramel sauce. Increase speed to medium, and beat until smooth and well combined. Frost cupcakes as desired (I used Wilton 2D) and drizzle with caramel sauce. Sprinkle with a pinch of sea salt just before serving.